Here's a time lapse video I made over the course of 5 long days (about 60 hours total) working on this painting from the very start. 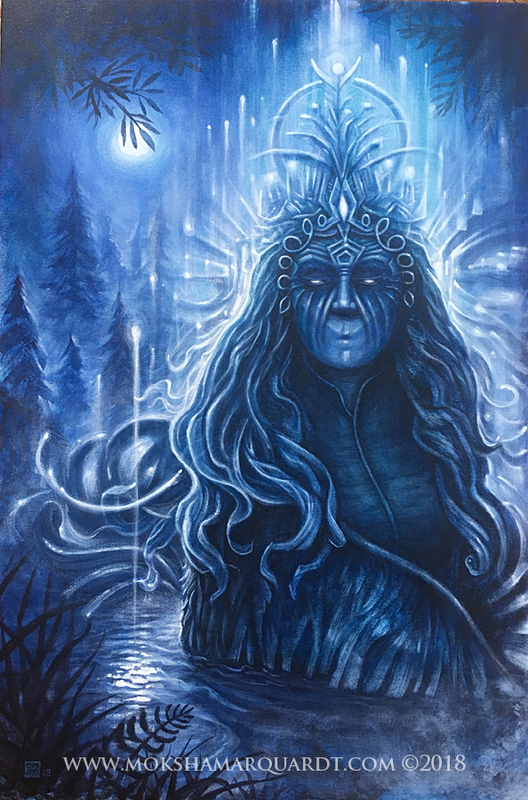 It is meant to be a companion piece to the "Forest Spirit" painting I made a couple weeks before. I started without any real concept or sketches, I only knew it needed to match the spontaneity and looseness of the Forest Spirit. This proved to be very challenging! You can see in the video how many times I had to rework the face before I found what I was looking for. So here it is, 60 hours compressed into a minute and a half! I spent the day on this untitled girl in yellow painting today. This has been on hold for months and still has a tremendous amount of work left before its done. Anyway, this video shows a full day of work condensed into one minute. I've started a new YouTube channel! Here is my first post, I'm basically just having fun with my new GoPro, learning how to create a time lapse video and all that. This little painting was made in about 5 hours or less. I'm working in acrylic on canvas here. The quick drying time of acrylic is important when live painting. I plan to do these time lapse paintings at least a couple times a month and the finished paintings will all be for sale immediately. Hit me up if you're interested in purchasing one.